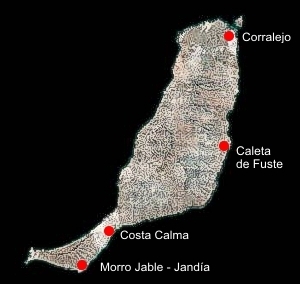 Fuerteventura Guide. Hotels into Fuerteventura. Hotels in Fuerteventura. On Fuerteventura there are four distinct Tourist Areas: Corralejo, Caleta de Fuste (also known as El Castillo), Costa Calma and Morro Jable / Jandia. (You can select a map from the tourist areas and see the hotels). Tarajalejo, with a hotel on the beach in this small coastal town. The Playitas resort with an interesting focus to the sport, with golf course. Puerto del Rosario, with several city hotels. The hotels of Fuerteventura ranging from 5 * deluxe hotels to three star hotels eminently familiar and all inclusive at a competitive price. They are present on the island since the big Spanish chains with an international presence (RIU, BARCELO, MELIA, H10), to foreign channels (SHERATON), through local hotel companies, but of great relevance (MUR GROUP, R2 HOTELS, HOTELS ELBA, SUNRISE BEACH HOTELS, TURICOMPLEX.